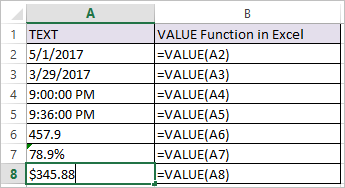 VALUE Function in Excel converts Text into numeric value or number. text – A text, that you want to be converted into numeric value or number. In the above examples different date and time formats, decimal values, currency formats and percentages are converted into numeric value. Note: #VALUE! 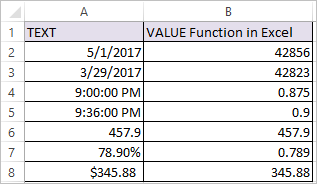 Error occurs if the supplied argument cannot be interpreted as a numeric value in excel.